A triangle is a three-sided geometric shape. In Euclidean geometry, each side of a triangle is perfectly straight, and the sum of the internal angles of a triangle is always 180º. A triangle is defined by any three points that are not collinear. Usually, the vertices of a triangle are counter-clockwise denoted by big Latin letters, while small Latin letters are used for the sides: Each side will have the same letter as the opposite vertex. The angles are denoted by Greek letters, if possible, the letter of an angle will correspond to the letter of the adjacent vertex. Often, the sides will be referenced by the adjacent vertices: in the triangle on top of this page, we have . Similarly, the angles are denoted as . A right triangle has one 90º angle. Right triangles have special properties (see trigonometry). An isosceles triangle has two equal angles, and two equal sides. An equilateral triangle has three equal sides, and three 60º angles. 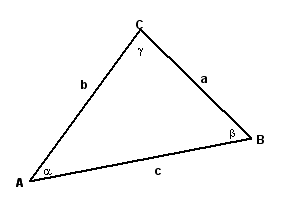 If a triangle is not one of the above, it is a scalene triangle -- that is, a triangle with no congruent angles. An obtuse triangle has one angle that measures more than 90o. Side-Angle-Side (SAS): If two sides are equal and the included angle is equal to another triangle, then the triangles are congruent. Side-Side-Side (SSS): If three sides of one triangle are equal to three sides of another triangle, then the triangles are congruent. Angle-Side-Angle (ASA): If two angles and the included side of one triangle are equal the ones of another triangle, then the triangles are congruent. Angle-Angle-Side (AAS): If two angles and a side that is not included are equal to the ones of another triangle, then the triangles are congruent. The SSA (Side-Side-Angle) cannot prove triangles congruent unless it is a right angle, where it is known as the HL (Hypotenuse-Leg) Theorem. AAA (Angle-Angle-Angle) cannot prove triangles congruent either. In hyperbolic geometry, however, it does prove congruence. This page was last modified on 30 August 2011, at 20:08.